I signed up to Ultimate for a number of reasons, yes to become slimmer, fitter and gain some self-confidence but mainly to change my unhealthy relationship with food & drink. For years I have tried faddy diets & juice plans with minimal exercise and zero positive results, gaining more weight every time I finished making me heavier than when I started. This resulted in me being low in mood and even lower in self-confidence. So I took the plunge and signed up to Ultimate Bootcamp. With the support of amazing coaches and a wonderful group of ladies we started the Ultimate challenge and it has completely changed my relationship with food & drink for the better. Working hard to achieve my goal to be healthy not only physically but mentally too. Her results were a total of 12lbs weight loss and 11.5 inches all over!! The biggest areas were 4.5in off her waist and 3.5in off her hips!! 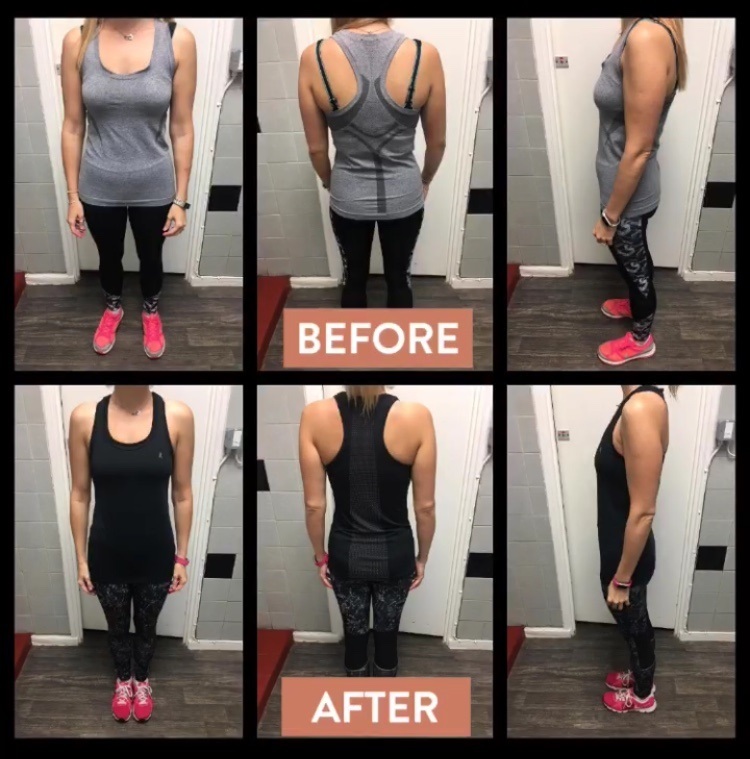 Ultimate Bootcamp Success Story! ………. Sally Davis signed up for Ultimate Bootcamp, not for fat loss, but to improve her overall health and fitness following a period of ill health. 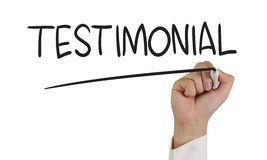 This is what she had to say about her experience…..
“Signing up for ultimate bootcamp wasn’t about losing weight for me, it was about fitness and toning, but more importantly, achieving a happier healthier me. Unfortunately, following an illness I developed an unhealthy attitude towards food and became more unhappy in myself. The first session of ultimate includes a food workshop which completely strips food and mealtimes back to basics, then rebuilds your knowledge based on what you want to achieve. The actual bootcamp sessions are filled with genuinely lovely women of all ages and abilities who are so encouraging and supportive of one another it doesn’t feel like a chore to be there. The PTs are amazing, no question is too silly and while they’ll tell you off for slacking at the back, a sneaky piece of cake or a glass of wine too many, they are very reassuring and understand that life can get in the way. They actively encourage you to do the best you can, no matter your ability or goal. Body Transformation during Ultimate Bootcamp!! 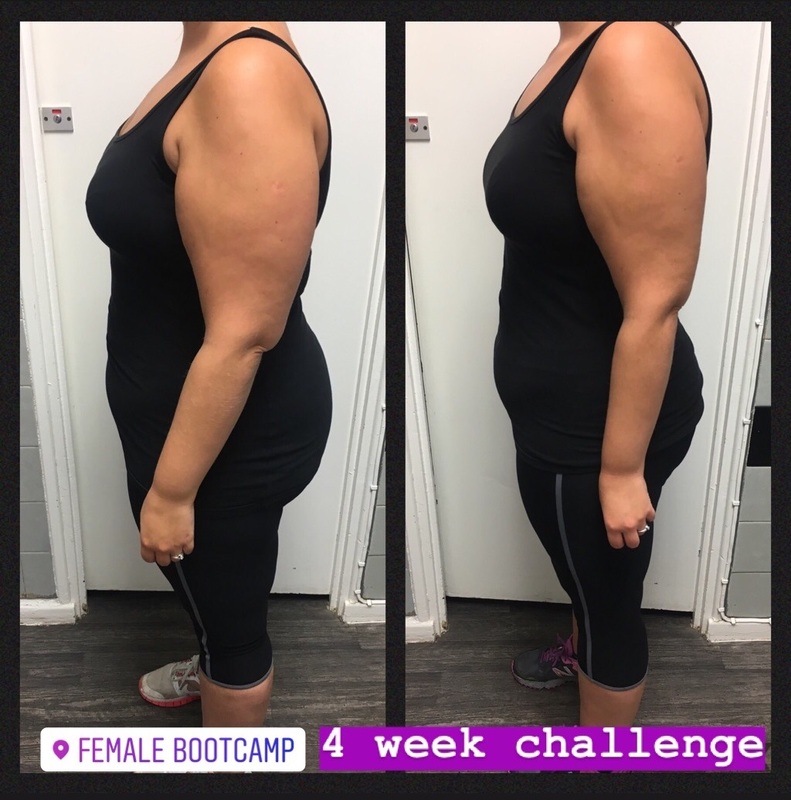 And the award 🥇 for the greatest body transformation during Ultimate Bootcamp goes to…….Emily Brown. Although Emily was a regular attendee of Female Bootcamp classes, she would be the first to admit that she had lost her way when it came to food and drink. A busy working mum to little Jack, Emily threw herself in to Ultimate Bootcamp, totally overhauling her approach to food and nutrition. Emily became the queen of meal planning and preparing ahead – taking time to batch cook healthy and delicious meals to quickly enjoy post workout or after a hectic day at work. . .
After completing four weeks of workouts and clean eating Emily lost an amazing 18lbs and 18 inches! But she has not stopped there! Two weeks later and she has lost a further 5lbs, bringing her total loss to 23lbs in 6 weeks! . .
Emily, you are a true inspiration and we are so proud and amazed by your incredible results. Keep up the amazing effort! Shout out to Sandra Birch who showed amazing focus and determination on the Ultimate Bootcamp Challenge last month. Sandra proved that with some careful planning and focus you can even go on holiday and still remain on track. She pushed herself to complete all five workouts a week despite being away and ate totally clean for the full four weeks. The results speak for themselves. Sandra lost a total of 8 lbs in weight and 12 inches from her body. She has burnt body fat and built lean muscle, which has changed her overall body shape. Sandra now feels fitter and healthier and has even overcome a severe back injury which saw her unable to train at all earlier on in the year. Well done Sandra, we are so proud of what you have achieved and the fact that you have maintained the clean eating and exercise now that Ultimate Bootcamp has finished. This year Female Bootcamp wanted to do something a bit different in the run up to Christmas!! We usually have lots of Ladies approaching us around the festive period saying they are feeling bloated, over indulging, not leaving the house because of the cold and giving in to the many tubs of chocolates around the office! So this year ladies we need to do something before Christmas so you feel and look amazing just in time for Santa. 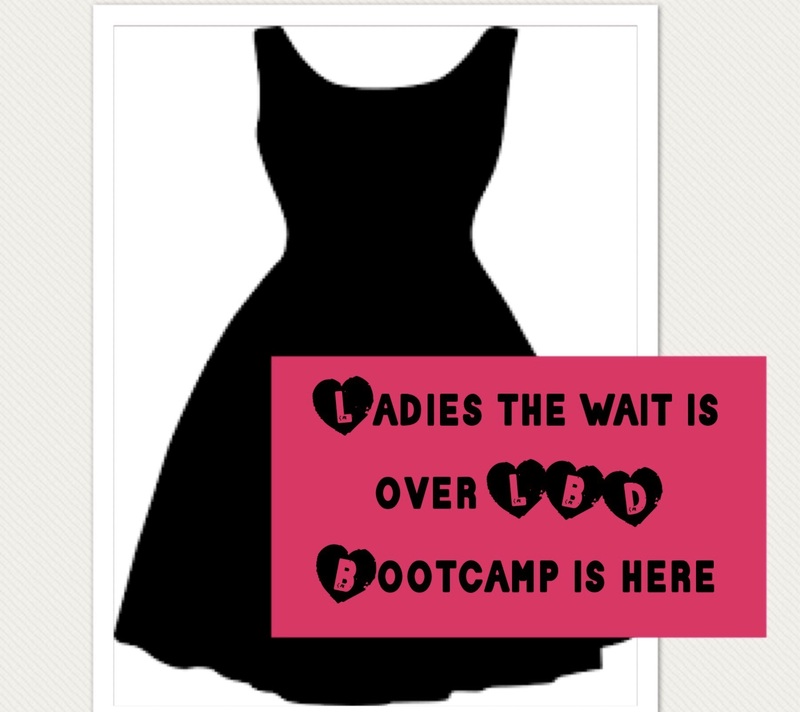 On Saturday 11th November THE LITTLE BLACK DRESS BOOTCAMP kicks off for our countdown to Festivity!! We start with the initial consultation at 11am, so if we could ask you all to arrive 15 mins early that would be great. During the consultation you will receive some freebies, we will talk about living a healthy lifestyle…. long term, no quick fixes. We will teach you how to weigh and measure yourself properly so you can see the changes in your body over 5 weeks, of which you will not only see the results on the scales, but you will lose inches. This will help to keep track of the progress you’re making towards your goals. The consultation will include what to eat and what to avoid, things you should be doing at home and the big changes you should be making, along with the chance to meet likeminded people and much, much more!!! Following the consultation you will take part in 5 exercise sessions per week. You will have a recipe guide and plan to follow and also you will be part of a Whatsapp group along with everyone on the course plus 4 instructors, providing you with constant guidance and reassurance. Also everyone has a little black dress to fit in to over the festive period or a Christmas party to attend so let’s do this!!! The course will last five weeks and we will be working out five times per week in true Bootcamp style. This course will finish just in time for Christmas and of course our very own Female Bootcamp Christmas party. After many fad diets, unused Gym memberships and the odd time of dragging myself to the local Zumba class, I knew I needed a change and a challenge that I could stick to. In August 2015 I found Female Bootcamp through a Groupon offer and thought why not give it a go. Two years on this was one of the best decisions I have ever made. I will never enter a gym again or follow a fad diet! Female Bootcamps is a place where no one is judged on size or fitness levels, it is a place where everyone is following the same goals and everyone motivates each other. I felt right at home from my first session! Unlike the gym where everyone is out to look on point and be body beautiful – unlike myself who always feels awkward with working machinery with fear of looking silly and paranoid that people were watching me workout – down at bootcamp this is not the rule – we all wear zero makeup, end up with sweaty hair – no one cares, this way we know we have worked hard and no one I loved this vibe from the word go. Every session is taken outside (all weather) which really motives and boosts my energy levels – especially when I work inside all day and sessions are generally repeated after a few months. This was also a bonus for me because I get very bored with exercise that is repeated making me loose motivation. I began to see results straight away because for the first time I was being educated about my body/fitness and food and also what I was capable of. The variation of exercises ensures that you receive an all over body workout that incorporates cardio and weights. A big part of my journey is the consistent and continued support from Fleur and her team – Louise & Kate. These ladies deserve so much credit for the work they do. They have pushed me to levels the last two years that I never thought possible. They have believed in me and my goals and praised my results and continually reminded me of why I go to Bootcamp. They are a valuable source of expertise when it comes to food and nutrition and will go the extra mile to educate female boot campers on what to eat when training (pre & post) to boost results. 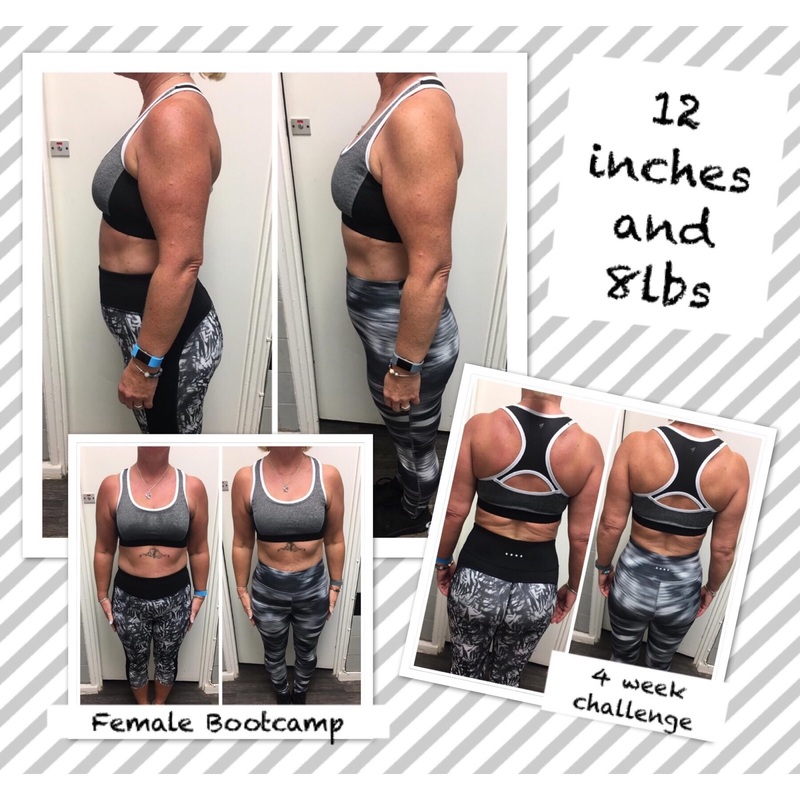 Having attended Bootcamp for two years my body shape and weight began to stick so I needed to give myself an extra challenge, so I signed up for Ultimate Bootcamp – a 4 week intensive course and diet plan. This was exactly what I needed before my holiday and wanted to be extra confident in my bikini (my goal). I upped my work out sessions to 5 a week with a street run at home and followed the diet plan and food ideas that were provided for us by Fleur. The big difference was portion control with the size of my meals I was eating, a small change here made a big difference to my body shape and weight loss. After 4 weeks I had lost 12lbs in weight, 6 inches across my body and 5 % of my body fat. The results were amazing and I never felt so good by the pool and on the beach. I have been so full and energised like I do on this plan and it is no longer a diet but my daily eating routine. I now eat clean for the majority of the week and seeing the results that training and eating right can do continues to motivate me to carry on. My fitness levels are now the best they have ever been on my gradual journey. For those ladies out there at a loss with diets and exercise I cannot highly recommend Female Bootcamp, Fleur and her team enough. I have met a lot of great people here who understand how hard it is to battle with exercise, weight and food but we all support and encourage each other and that said I have made many great friends. I began Female Bootcamp a size 14 and guess what – I brought a pair of size 10 jeans yesterday! IT WORKS guys and you feel great when you reach your goals!! At Female Bootcamp we do our best to cater for everyone!! However home, work and family life sometimes gets in the way!! That’s why we’ve brought out a little extra for you all!!! 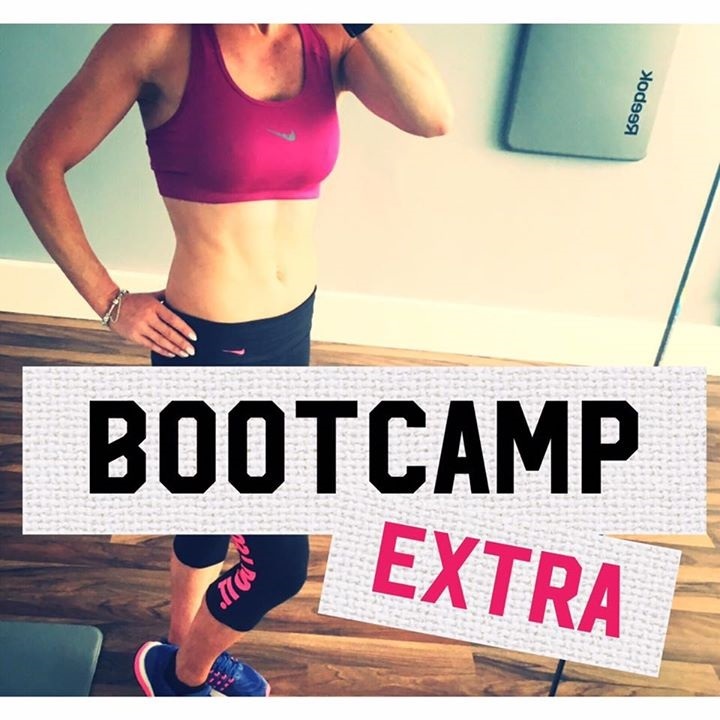 * Bootcamp Extra will start on Sunday 10th September and will include three sessions of training for six weeks so eighteen sessions in total. * The sessions will include Sunday’s at 9.30am, Tuesday’s Box Hiit class at Smestow School at 7pm and a Voucher to attend any Female Bootcamp class of your choice at The Old Wulfrunians Sports and Social Club, Castlecroft. * If you were to purchase the sessions individually they would cost £90 so you will make a saving of over £30 as you will receive all of the above for JUST £59. * This course is a one off and we have very limited places, therefore if you are interested please get in touch ASAP!!! Please note this course will not include weighing and measurements however we will provide you with a sample food guide. Any questions in relation to healthy eating can be discussed during the sessions with other attendees and the instructor. 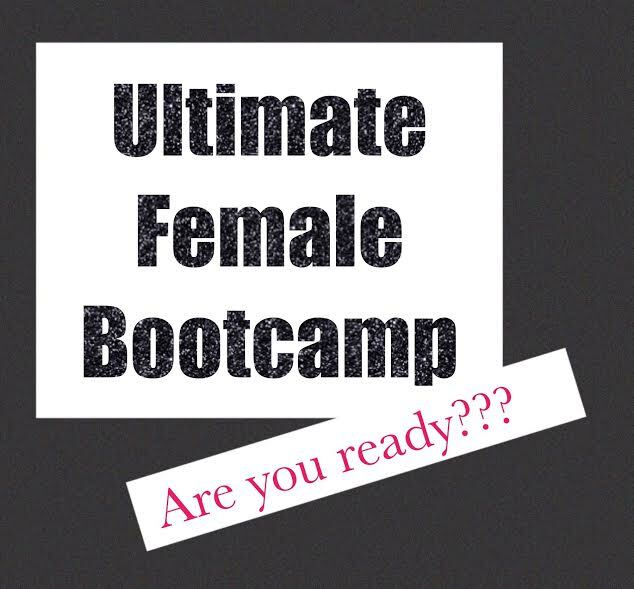 Ultimate Bootcamp is designed to give you the real push you need to strip your body of EXCESS fat. We want to strengthen your body and improve your mental health. We would like to introduce you to a new way of life and hopefully after spending five weeks on our intense course you will make the changes you need to live a healthier life forever. We plan to get you working out five times per week and if you complete all of the sessions we believe you will improve your fitness and look and feel amazing. We will be giving you a weekly pass to bootcamp which will entitle you to one additional bootcamp class per week and you must do the one hour of homework we set you per week. Are you ready for the challenge ladies?? This is the time to push yourself and see what you are truly capable of we will help you as much as possible and there will be three trainers on hand to help with all your questions 24/7. If you are game ladies, move quickly places are limited!!! Well, we have come to the end of our beginners running club and everyone has made such amazing progress. Five weeks ago several of the ladies had never run before and found it tough to complete a lap of the field at Bootcamp. However through hard work and dedication at two sessions per week they have all completed a 5k run and some have even surpassed this goal! Amazing! Every session they worked hard to build up their leg strength and endurance through running based drills and exercises and then we gradually increased the distance of our road run each session. Yes there were hills, cramps, soaking wet clothing from torrential rain and a lot of DOMS but the ladies stuck with it to achieve their goals and I’m so proud of them all. There is even talk of coming back to train for a 10k next time! Well done ladies, you have achieved so much and supported one another through every session. 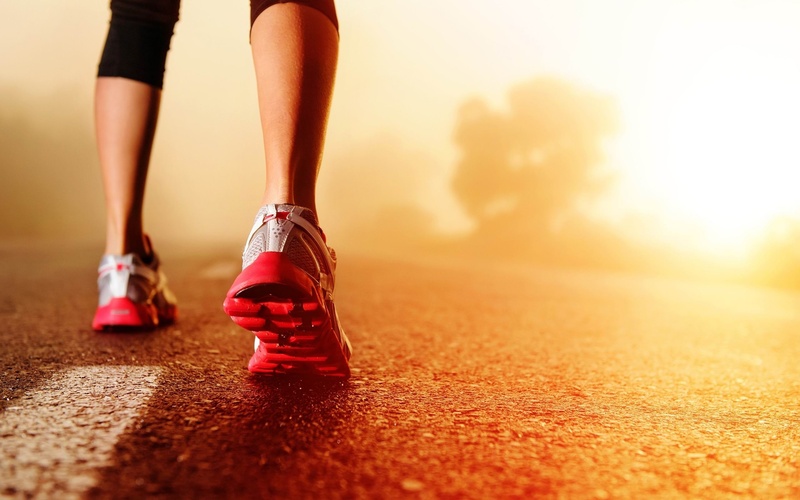 Keep up the good running until our next Female Bootcamp running club! 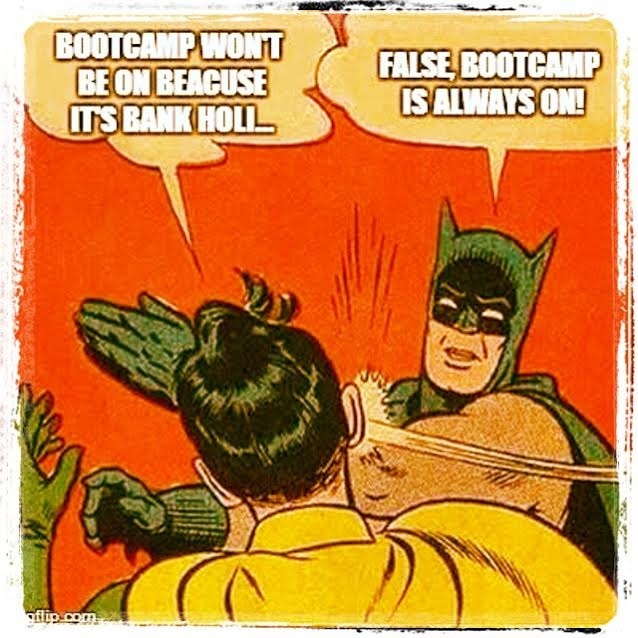 Its bank holiday this weekend and as always you know we will be doing one class on Saturday at 9.30am and one class on Bank holiday Monday at 9.30am. So start your bank holiday with a work out, bring the kiddies if you need to they are more than welcome.